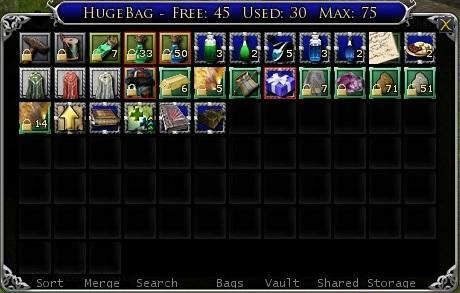 Items that are in the bag and on the quickslots disappear from the bag after use, they are not deleted but you can't see them anymore. another great attempt for an inv plugin, but the 'watermark' really ruin the feel, TBH. To X672: Thanks for the info, I'll take a look on what I can do. Perhaps have an 'about' screen, showing all relevant info, authors and version? or maybe watermark the option window(s)/menu(s) instead. just anywhere but the main window. thanks again for all you've done so far. The 'about' window would be perfect, why I didn't think of that. ...e Rings Online\Plugins\HabnaPlugins\HugeBag\Main.lua:57: Failed to import package "HabnaPlugins.HugeBag.SortingList". Last edited by Habna : 05-27-2011 at 01:03 AM. This is the best bag replacement I've seen so far, but a couple of issues are stopping me from using it. 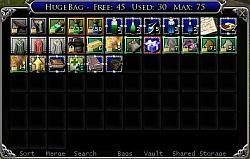 - When I equip an item from the bag, it doesn't seem to work properly and leaves odd entries in the bag until a relog or unload. - The widget position is too low, i'd much prefer it higher up the screen, so an option to change the position of the widget would be helpful. I'll add the option to change the height position of the widget in the next update. 1. As has been mentioned before, the ability to move the widget to wherever you like would be wonderful. Also, an option for horizontal placement in 'closed' mode (so you could position it on either the top or bottom of your screen) would be great as well. 2. A right-click menu that brings up the various selectable options would be preferable to allll those console commands. EDIT: Aha! I see that you've already done this - Cheers to you, sir! Beyond those two suggestions, this is a really great plugin and I'm looking forward to using it on a regular basis. Well done! Last edited by Emberleaf : 05-26-2011 at 10:15 AM. Noted. The widget is now movable up and down (without going out of the screen) I'll play test it later on with a fresh install. Last edited by Habna : 05-27-2011 at 01:04 AM. Failed to resolve package "". ...\Plugins\HabnaPlugins\HugeBag\frmFunctionsWidge t.lua:252: Failed to load background image. ...nline\Plugins\HabnaPlugins\HugeBag\frmMainWidge t.lua:6: Failed to import package "HabnaPlugins.HugeBag.frmFunctionsWidget". 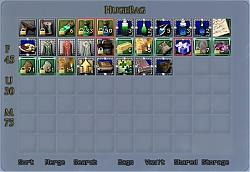 ...e Rings Online\Plugins\HabnaPlugins\HugeBag\Main.lua:82: Failed to import package "HabnaPlugins.HugeBag.frmMainWidget". Last edited by Emberleaf : 05-27-2011 at 11:38 PM. Just open up that frmFunctionsWidget.lua file and comment out line 252.. It's referencing a graphic that wasn't on mine. Working fine now though. Removing that line worked as far as being able to load the plugin. But I can't figure out for the life of me how to move the widget (now that the functionality has been added).